My blog reached 10,000 views today! To celebrate, I’m sharing details about my most recent finished object—the 10th Doctor’s sonic screwdriver, which I have conveniently modified to serve as a chapstick holder! 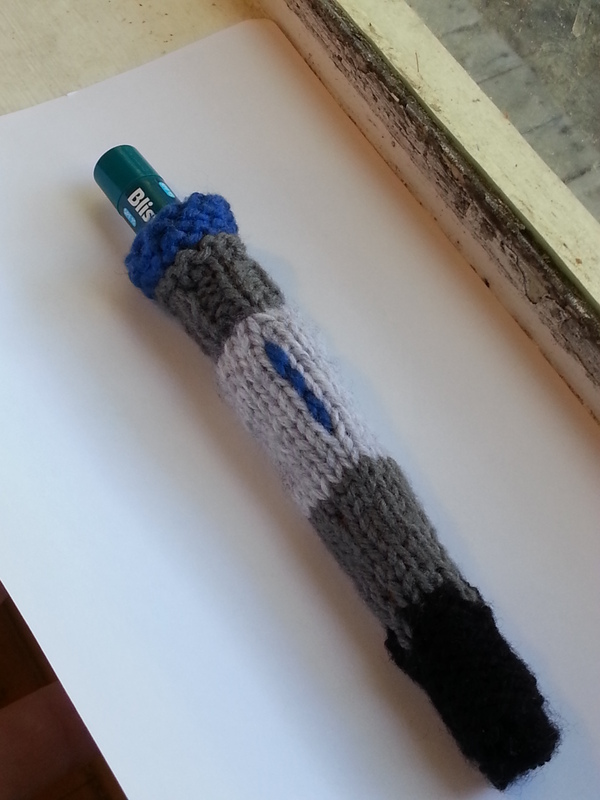 This project is a modification of a modification of an original pattern for a Doctor Who sonic screwdriver. 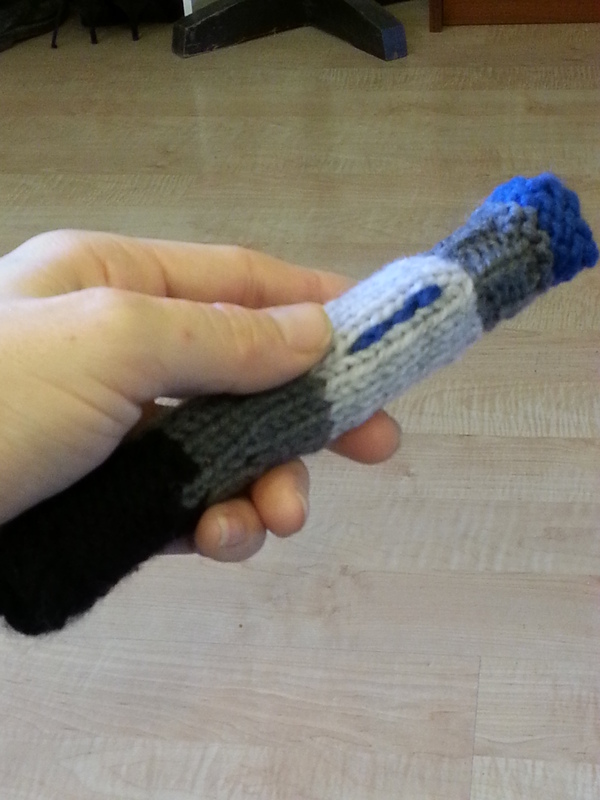 That pattern was for the sonic used by the 11th Doctor (Matt Smith), which is different in shape and size. I found this modification from user Cordetta on ravelry that changed the colors and some of the shape to be more like that of the 10th Doctor (David Tennant), which is what I wanted. I have to give a lot of props to her mod for helping me out! But I had to modify it even further to make it shorter and tighter to fit two chapsticks with just a little room on the ends. To be honest, when I finished this project it was late and I did not record every single detail of my knitting. But I wrote down enough to tell you approximately how I did it. -size 3 double pointed needles (set of 4), yarn needle. Cast on 9 sts in black, divide over three needles, and join to knit in the round, being careful not to twist stitches. With blue yarn and yarn needle, stitch a straight line lengthwise up the light gray section. *if you haven’t done colorwork before, consider skipping these two rounds and going straight to the gray section, it’s kind of annoying to do. If you chose to do it (I promise, it looks cool! ), be careful to move the black yarn to the inside of the work at the end of the last round. **at this point, if you want to weave any of the ends into the inside of the tube, do it now! It will be too tight to turn it inside out after the final section. As always, remember that my gauge is looser than most—use your own tube of lip balm as a guide. The way I made mine, both ends are open but they are tighter than the middle section, so the chapstick naturally remains inside until I push it out. I’m sure there are ways you could make a closure at the top or bottom, but I found I didn’t need it. The sonic screwdriver chapstick holder—it doesn’t work on wood or deadbolts, but it does work on dry lips! Happy 2014! 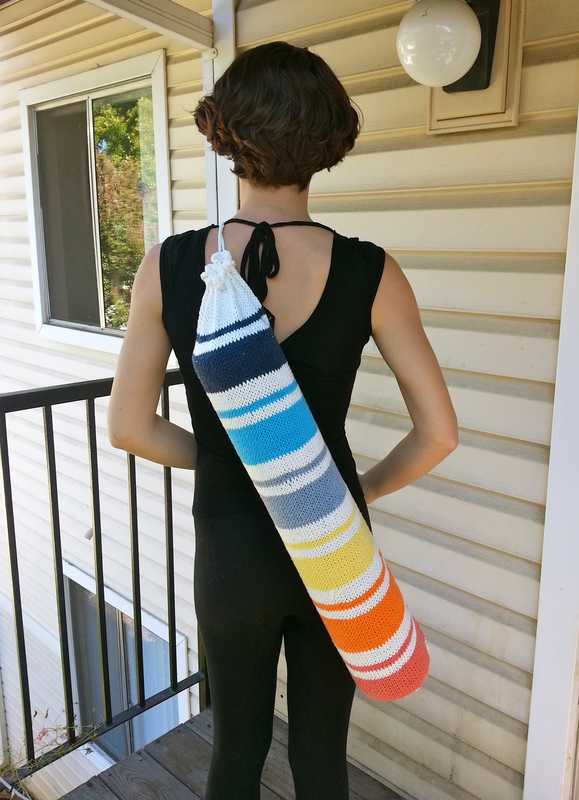 I have been meaning to share this knitting pattern for a Yoga Mat Bag, and I figure the start of a new year is probably a great time to put it out there. (I’ve actually got a series of activity-related knits I’m planning to write about—stay tuned). 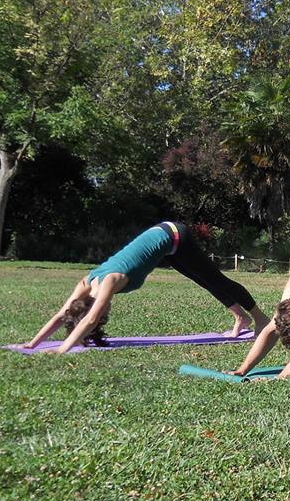 I have done some yoga off and on for years, but this year but I hope to do even more. I think this pattern is perfect for (almost) mindless knitting on those cold January nights, and it will help you keep your New Years’ resolution to be more healthy—well ok, it may not actually help you do a sun salutation or attempt a headstand, but it might inspire and motivate you nevertheless. Oh and did I mention this my first ever pattern?? I never originally set out to make up my own patterns. I reasoned that it would be too much work. 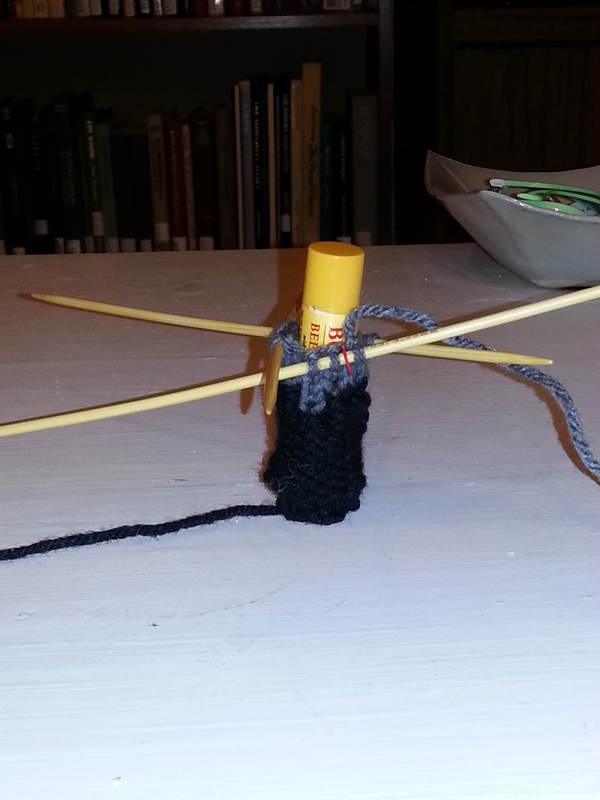 However, as I accumulated more years of knitting experience, I found that I was heavily modifying certain patterns. (I originally had this pattern up on ravelry as an extreme variation of this pattern but I now think mine is significantly different). I named this pattern Sunrise because that’s what the colors remind me of, and because last summer I went to an early morning yoga session in a park that was glorious, and it reminds me of then (yep, that’s me, yoga-ing on the grass). This began as a modification but morphed into my own design, particularly the color work. It’s no masterpiece and it may have some errors, but I have decided to try and write it up, as a free pattern for you. 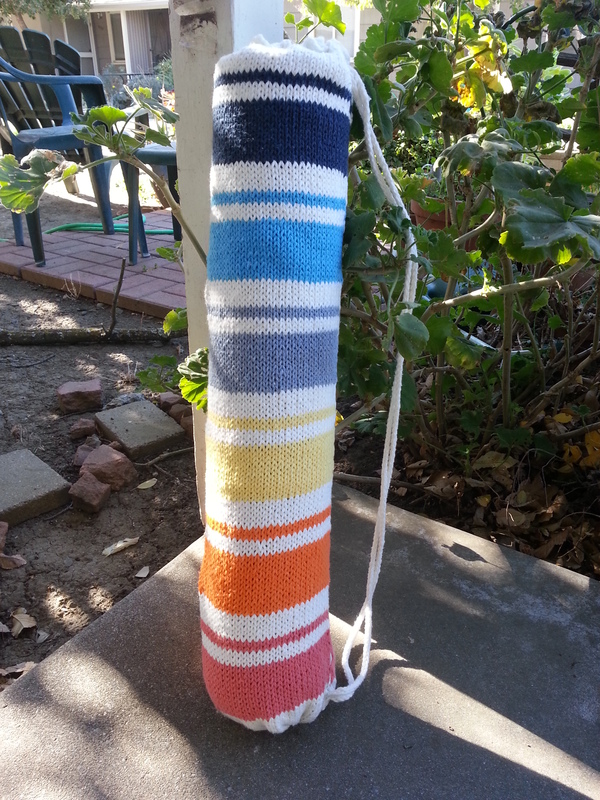 Cast on 35 stitches in White, leaving a long tail of yarn for later. Do not join yet. Round 13: Switch to Tangerine. Knit. Round 29: Switch to White. knit. Eyelets: knit 2, yo, k2tog. Repeat until end of round. Weave in ends. Thread long tail of yarn from the beginning of the project through the cast on loops and draw together until tight. Secure end of yarn tail to the bag. Continue until you have 75-80 inches of I-cord. Cast off. Thread one end of the drawstring through the eyelets at the top. Fasten both ends of the drawstring securely to the bottom of the bag. I am a loose knitter, always have been. You may want to go up several needle sizes if you are a tight knitter. The coolest part of this design is that when you put on the strap, the bag cinches up at the top on its own. I can’t take credit for this idea, I’ve seen it on other yoga bags, but I figured out how to do it myself. 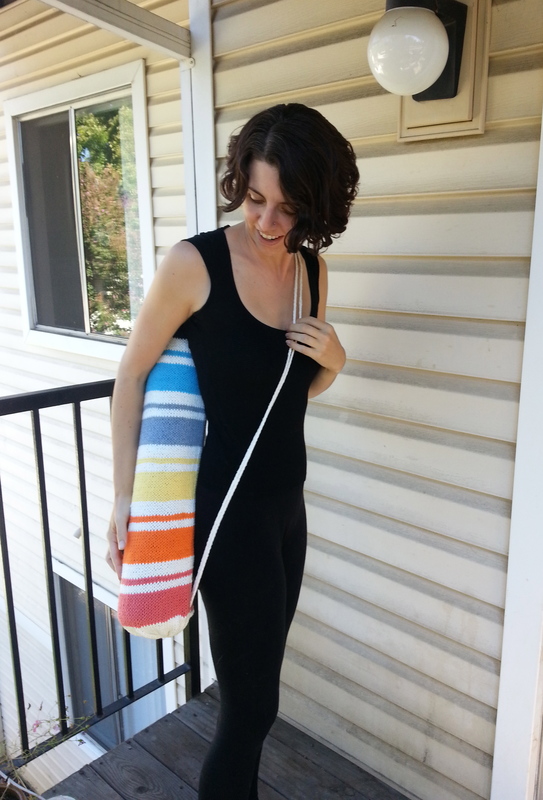 Perfect for taking your yoga mat with you on a bicycle!